Some of London's fussiest diners are also the littlest ones and it's a tricky task pleasing every member of a family at once. When it comes to child friendly restaurants, crazy cartoons, wacky colour schemes and chicken nuggets can feel a little patronising for parents. So here's our pick of London's best restaurants which will satisfy kids and grownups alike. They've conquered Bermondsey Street, and now the team behind the excellent Garrison and Village East are working their brasserie magic in the West end. Bric a brac, shabby chic in design but executed perfectly with many restored elements The Riding House Cafe is housed in a terrific light filled ex-rag trade showroom. Split into three sections including the 'Campbell's Tomato soup' coloured dining room, a large bar lined with comfy stools and a huge central table seating 19 on surprisingly comfortable vintage theatre chairs, and a small lounge area on the far side. Great locally sourced British cooking and a fabulous breakfast spread, also a highly recommended destination for a relaxed Sunday lunch. A wonderful addition to the somewhat sparsely populated restaurant scene north of Oxford Street. Oh how we wish we lived in Bermondsey, then we could call this gem of a pub our local. We'd stop in for a regular drink at least once a week and treat ourselves to a slap up meal every month. Similarly to the Riding House Café - the West end brasserie from the same team - it's the kind of place that we'd like to claim as a second home with a convivial atmosphere, plenty of drinks variety and great food - though the prices would prevent us from making this a daily ritual. They even have their own cinema in the basement, available to book for private parties, which is even better than our previous favourite place to go to the movies, the Electric cinema in Notting Hill. With eateries like this, along with nearby Village East, The Bermondsey Kitchen, Delfina Studio Cafe, and not forgetting The Hide Bar... oh how we wish we lived in Bermondsey. What with The Cow, Lucky 7 and Crazy Homies next door as well as this deli down the road, Tom Conran - middle son of Sir Terence - has well and truly established himself in this fashionable corner of Notting Hill. He's clearly doing something right - the locals can't get enough and each place gets pretty packed, especially at weekends. 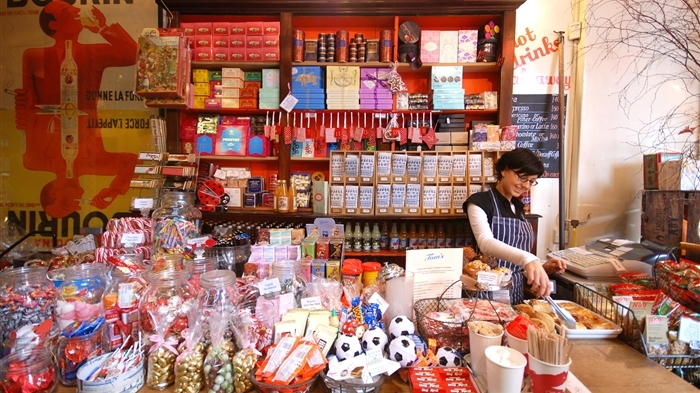 Don't let the crowds deter you, once inside you will be dazzled by a Wonker-esque treasure trove choc full of sugary wonders. Rows of jars bursting with spacehoppers, candycanes and bonbons make Tom's Delicatessen a big hit with big and little kids alike. The diner style cafe is located at the back and has a small outdoor terrace area. It can get particularly popular at brunch time so be prepared to join the queue if you want to sample the Eggs Benedict served with real hollandaise sauce and Parma ham. It comes highly recommended. The deli downstairs is crammed with every fashionable culinary ingredient you can think of from organic olives to delicious - predominantly British - cheeses, fresh artisan-made bread, jams, fine meats and charcuterie. If you didn't reach maximum sugar capacity on your way through then take your pick from the tempting cake display. Of all the many burger chains in London, Byron is the least gimmicky and could well be the best. Byron promises to source its beef from small farms in Scotland where cattle have roamed the highlands and eaten grass for two to three years before slaughter. Buns are baked daily from a fourth generation family baker in the East End and burgers freshly ground every morning at 5am. 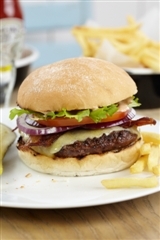 The menu is simple: a classic burger, a cheese burger (with four types of cheese to choose from), a Byron burger (dry cure bacon, mature cheddar and Byron BBQ sauce), a bun-free skinny option with salad, a chicken burger and a veggie option (grilled Portobello mushroom, roast red pepper, spinach and goat's cheese). And the verdict? "That's about the best burger I've ever had," claims The Times restaurant critic Giles Coran. We agree: the burgers here are mighty fine especially the Byron with extra avocado. Sides include French fries, home made thick chips, onion rings, courgette fries, coleslaw and macaroni cheese, while there is a selection of salads and desserts on offer. Not ones to forget about the bigger picture, Byron also offer an impressive selection of craft beers as the perfect accompaniment to the burgers. The beer list changes every six months and offers local favourites, worldwide options and their very own Byron Pale Ale. Casual New York-Italian style Hai Cenato is the first Italian restaurant from Jason Atherton. Crowd pleasers like margherita pizza, beef ragu pasta and pasta with tomato sauce and cheese are on the kids' menu at Hai Cenato, Jason Atherton's Italian restaurant within the NOVA development in Victoria. A casual New York-Italian style menu offers choices of small plates, pasta and risotto, grills and specials, as well as sourdough pizzas. For the perfect treat, kids eat for free during Saturday lunchtime and all-day Sunday during the February half term. After a very popular London introduction in the East end, Pizza East has a new sibling located in an old pub in Notting Hill - refurbished to Soho House eclectic standards naturally. The ground floor is an airy space with huge open windows and a few tables on the pavement, as well as an informal dining room upstairs with a cozy terrace. The menu offers ciabatta-style pizzas – the signature one being Portobello mushroom, taleeggio and oregano- wood oven alternatives such as whole pork belly and tempting desserts including a salted chocolate caramel tart. Open seven days a week from breakfast until midnight and also offering take away from the deli counter stocking goodies from the restaurant larder as well as niknaks to take a bit of the Soho House experience home. On the ground floor of the offices of award-winning architects Allies and Morrison The Table makes an excellent staff canteen (a bit like The River Cafe only here it really is a cafe). When the practice came to design their own offices they decided to convert the bike shed underneath into a cafe. They are also responsible for the entire Blue Fin Building just across the road, as well as landmark projects like the Royal Festival Hall refit and the Peter Harrison Planetarium. King's Cross and the Olympic site's media centre are also significant projects. At The Table prices are surprisingly affordable - especially given the modern architecturally designed space. You can serve yourself from the counter, eat in or takeaway, choosing from the daily changing menu, which is likely to include a fish of the day, homemade tart and sandwiches, complemented by Monmouth's excellent coffee. We recommend coming here for the award-winning weekend brunch - it's what you've worked hard all week for. A real pleasure. The warm and colourful Giraffe restaurants are popping up all over London - there are more than twenty around town - adding a splash of colour to the city's dining scene. At the Marylebone branch there's outside seating too, but once inside you'll find African safari decor stencils on the walls, wooden tables and a really warm welcome. In fact, the whole restaurant positively beams with warmth and cheerfulness so it's no surprise that this place really appeals to kids. But the all-day menu is a winner with adults too - you can breakfast on organic porridge, pop in for coffee or cocktails as well as eating from a menu of globally inspired dishes and good-for-you food. The menu extends from burgers to really tasty freshly squeezed juices, blueberry pancakes to stir fried udon noodles. Portions are big so if you can't manage a whole three course meal starters like the spicy chicken wings and vegetarian mezze are good options. There's a special menu just for kids too. Your ravenous tots can choose from a brunch of fried or scrambled eggs, beans, veggie or pork sausages, or mini-mains like fish fingers and pasta. It may appeal to a parents looking for somewhere to keep the kids happy but that doesn't mean it's overrun with tots and teens, and adults are made to feel welcome too. Carluccio's are springing up all over the place, from Bluewater to Brent Cross, spreading the gospel of good fresh superior Italian food. Each restaurant is also a deli selling wonderful pastas and produce, and the menus offer a taste of superior Italian cooking. Started by chef Antonio Carluccio who first arrived on the London restaurant scene in 1981 with his Neal Street Restaurant in Covent Garden (no longer there), he may not be in the kitchen but his winning formula of good food, simply cooked still applies. His former wife Priscilla (sister to Sir Terence Conran) took Carluccio's passion for food and turned it into the highly successful chain, selling out in 2005 for a reported £10 million. However the mission to wake England up to the joys of Italian cookery continues apace, with pizza and pasta of course, but also roasted sardines, veal tonnatto and adventurous meat dishes on the set menu, and some mouth-watering Italian breakfast options. At Carluccio's the prices are pitched so that the many outlets cater for a largely middle class crowd. Pizza Express this is not: a meal at Carluccio's is a lot more indulgent, interesting and considerably more memorable. Jamie Oliver's 'bish, bash, bosh', 'easy peasy', 'lovely jubbly' style of cooking lends itself well to the simplicity of Italian cuisine as Jamie's Italian in Kingston, opened in November 2008, attests. Love or hate the cheeky chef who made riding a Vespa part of his jaunty image, you can't deny his enthusiasm - he promotes cooking with a passion which the Italians would recognise as their own. With his 'Italian' restaurants (there are others in Oxford, Bath and Brighton), Jamie brings rustic, simple dishes like Prosciutto, wild rocket and sliced crisp pear as well as delicious plates of homemade pasta (available as large or small portions) to the table. For the full, authentic Italian experience, start with bruschetta on sourdough bread, rubbed with garlic and topped with rocket and parmesan pesto, then antipasti of cured meats, followed by pasta. Who knows how anyone can manage to fit in mains and desserts after all that but, if you can, try the Italian Bakewell tart and Italian ice cream for a unique mix of English and Italian traditions. The kid's menu strays from the typical chicken nuggets and instead includes chargrilled chicken 'lollipops', mac 'n' cauli cheese and mini sliders (burgers), all of which are served with a shake me salad and unlimited organic cordial. Daylesford Organic brings the taste of the Gloucestershire countryside to Notting Hill with the Bamfords bringing produce from their country estates to the city. The minimalist, cream and white decor could only exist in the city (no muddy wellies here, thank you) but the produce is the best all-organic stuff you'd find at an authentic farmers' market. There are several parts to the shop situated on the well-to-do Westbourne Grove: the family-friendly organic cafe, Bread Bar for homemade patisseries, The Larder for fresh fish and meat, and the food shopping side of things. Shelves and baskets are neatly stacked with the best breads and biscuits, seasonal fruit and veg as well as longer life staples like dressings and mustard. There's an excellent wine offering too, many of which are biodynamic or organic, shipped over from Daylesford's sister estate in the South of France. Delicious, contemporary and chic, we think Daylesford is a destination in itself, worth seeking out if you're looking for something a bit special. It doesn't get much hotter than Mexican market food and Thomasina Miers (praised for her bold cooking style when she won MasterChef 2005) is hot stuff right now too. With this, her first Wahaca restaurant, she injects pale Londoners with some colour. The simple menu borrows heavily from traditional Mexican ingredients, but instead of travelling to South America for them (that would be bad), most are locally sourced - which is good. You may be surprised to learn that they use habanero chillies from not so far away in Devonshire. Bread-based dishes are the mainstay from tacos and taquitos to quesadillas and burritos followed by churros y chocolate for an indulgent dessert. The small tapas-like dishes make it a great option for sharing families and kids enjoy the bright and cheery surroundings. The light wood interior and tins of non-perishable goods decorating the walls make for a fun, buzzy atmosphere and that fact the you can't book makes it more of an impromptu place - well, you wouldn't be able to book at a Mexican market either. Tramshed has extended its kids eat free offer for half term. Mark Hix has finally seen his patience pay off with the opening of HIX at The Tramshed in Shoreditch, east London. In 2011 all seemed lost when his plans to open a restaurant on the Rivington Street site were scuppered due to fears about late night noise. Fast forward to May 2012 and the famous Tramshed building on Garden Walk and Rivington Street, built in 1905 as an electricity generating facility for the Tramway System, has been revived and reinvented as a 150-seat restaurant complete with a Damien Hirst cow-in-formaldehyde-tank artwork. The chef who began with a restaurant in Lyme Regis, Dorset, has already proved his mettle with London restaurants including Hix Oyster and Chophouse in Smithfields, Hix Soho, and his recent venture, Hix Belgravia at Belgraves hotel. For Tramshed he has teamed up with business partner Ratnesh Bagdai to open a restaurant in which steak and chicken features prominently on the menu (as well as the art) with marbled sirloin measured by weight. Architects Waugh Thistleton have employed "great planks of Douglas fir, leather and heavy gauge stainless steel" to compliment the existing Edwardian glazed brick interiors while seats - the same ones used by the USA prison service - are made from recycled coke bottles. Tom's modern British twist on a French brasserie. Tom Aikens' casual restaurant in Canary Wharf is a family-friendly sort of place all year round but for half term they're offering free kids' meals at the weekends, when accompanied by a paying adult. Delicious child-friendly dishes that little ones will love include healthy breakfast options of porridge with bananas and eggs on toast as well as a range of classically British lunch and dinner choices. Fish nuggets, fries and mushy peas, sausage and mashed potato and crispy chicken, mash and green beans are all on the menu at Tom's Kitchen in Canary Wharf, Tom Aikens's modern British twist on a French brasserie. From cheap budget hotels to luxury 5 star suites see our discounts for hotels, including The Trafalgar St. James London, Curio Collection by Hilton from 51% off.